uuid : e01cebb0-5184-47d6-88c0-ba97df1fe5a9 templates_id: 119567 templates_uuid: "e9807d35-b54d-4362-a967-2698d254f811" title: "Licence to Assign - Free Assignment of Lease - Template Lease Assignment" display_name: "Licence to assign" meta_keywords: "Assignment of lease licence and Lease assignment licence" description: "
If you are a landlord of a commercial property and your tenant wants to assign, or transfer their obligations under the lease to another commercial tenant, use this licence to assign to formally give them your consent to do so. 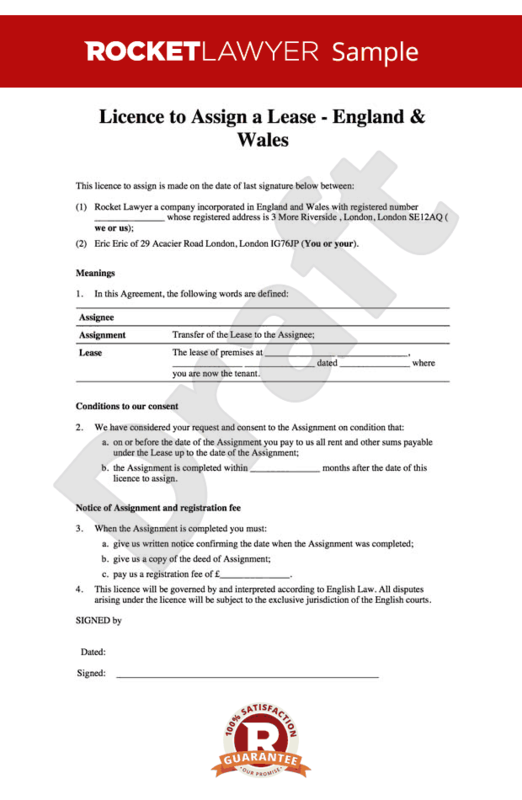 This document contains all the usual provisions, including an optional requirement that the tenant will guarantee the rent and sums due under the lease, a time limit for completion of the lease assignment and the landlord\'s registration fee. A licence to assign is an agreement between a landlord and a tenant where the tenant wants to assign or transfer their obligations under a lease to another party (known as the assignee). Why do you need a licence to assign? You will need to use a licence to assign if you are a have a lease of property and the lease doesn\302\222t allow the tenant to transfer the lease to a new tenant, without first obtaining landlord\302\222s consent. This licence to assign is suitable if the lease was originally granted on or after 1 January 1996 and does not contain a clause stating that it is an \302\221old\302\222 tenancy for the purposes of Landlord and Tenant (Covenants) Act 1995. What happens if the lease doesn\302\222t allow assignments? (2) intends to use the property for a purpose not allowed by the lease (e.g. using a shop as a fast food outlet or restaurant). Commercial landlords often require the assignee to show three years\302\222 accounts demonstrating after-tax profits at least three times the level of the rent due under the lease, or to provide a director\302\222s, parent company or bank guarantee. Where there is a legitimate doubt over the assignee\302\222s financial strength the landlord may insist that the current tenant guarantees the assignee\302\222s ability to meet all tenant obligations under the lease. In what form must the tenant\302\222s application be? There is no prescribed form for a tenant\302\222s application for consent to assign, so the request may have been made by letter or email or even verbally. Do you know the date when the request to assign the lease was made? If the date is known, the licence will include the date the tenant first made a request to the landlord for its consent to the assignment. If no date is known, the licence will just state that a request was made. The landlord can set a time limit for completion of the assignment and is entitled to insist that the assignment takes place within a reasonable period after the date of references of the assignee were provided. If the assignment has not been completed within the agreed time period, the tenant will no longer have permission to assign the lease and the tenant will need to re-apply for permission. A landlord can charge the tenant to register an assignment, fees of \302\24325 or \302\24350 are common. \r\n" created_timestamp: "2018-10-08 04:36:59.0" modified_timestamp: "2018-10-08 04:36:59.0" active: true created_by: 157 modified_by: 157 dcm_id: 84 url_slug: "Licence-to-assign" meta_description: "Create a licence to assign if you are the landlord of a commercial property and your tenant wants to assign to another business with step-by-step guidance from Rocket Lawyer. Try our assignment of lease for free." time_to_complete: "10 minutes" role1: "Landlord" role2: "Tenant" role3: "Assignee"
If you are a landlord of a commercial property and your tenant wants to assign, or transfer their obligations under the lease to another commercial tenant, use this licence to assign to formally give them your consent to do so. This document contains all the usual provisions, including an optional requirement that the tenant will guarantee the rent and sums due under the lease, a time limit for completion of the lease assignment and the landlord's registration fee. You will need to use a licence to assign if you are a have a lease of property and the lease doesnt allow the tenant to transfer the lease to a new tenant, without first obtaining landlords consent. This licence to assign is suitable if the lease was originally granted on or after 1 January 1996 and does not contain a clause stating that it is an old tenancy for the purposes of Landlord and Tenant (Covenants) Act 1995. What happens if the lease doesnt allow assignments? (2) intends to use the property for a purpose not allowed by the lease (e.g. using a shop as a fast food outlet or restaurant). Commercial landlords often require the assignee to show three years accounts demonstrating after-tax profits at least three times the level of the rent due under the lease, or to provide a directors, parent company or bank guarantee. Where there is a legitimate doubt over the assignees financial strength the landlord may insist that the current tenant guarantees the assignees ability to meet all tenant obligations under the lease. In what form must the tenants application be? There is no prescribed form for a tenants application for consent to assign, so the request may have been made by letter or email or even verbally. A landlord can charge the tenant to register an assignment, fees of £25 or £50 are common. More than just a Licence to assign template, our step-by-step interview and guidance makes it easy to create your document. Easily create online, download, print and sign your free Licence to assign in minutes. This document is also sometimes called: Assignment of lease licence and Lease assignment licence.